Dr. Bell earned her Doctor of Veterinary Medicine degree at the Western College of Veterinary Medicine in Saskatoon in 1984. Helen has worked in exclusively feline practices since 1987 and finds feline medicine and surgery a stimulating, fascinating and ever-changing field of work. Her particular interests are internal medicine, including cancer care, feline geriatrics and chronic disease management. Dr. Bell is a member of the Canadian and B.C. Veterinary Medical Associations, American Association of Feline Practitioners and the American Animal Hospital Association. At home she has two cats Wooly and Mish-Mash who provide constant entertainment. In her free time she enjoys spending time with family and enjoying all that Victoria has to offer! Hi everyone, my name is Ellen (Ellie) Everson and I am thrilled to be starting my career as a feline veterinarian this year at Pacific Cat Clinic! Some of you may remember me from the time I that worked as a patient care coordinator here at PCC, before starting my journey through vet school. That was the year in which Dr. Bell helped in shaping my natural love for cats into a passion for pursuing the knowledge and skills in feline medicine that will allow me to spend the rest of my life doing what I love - caring for cats! I have spent the past four years studying and training at the Ontario Veterinary College in Guelph ON, and I am now very excited to return to the island and begin putting those years of hard work to good use. When not working at the clinic I enjoy jogging with my partner Tyler, sun-basking with our two Cornish Rex cats Mr. White (pictured) and Colonel, and cuddling with our bunny-rabbit Jezebel. I cannot wait to meet (or re-connect) with all of you and your feline friends! Our lovely head technician graduated in 2011 from Red River Collegiate College, and moved to Victoria in 2013 to escape the cold Winnipeg winters and be closer to the ocean. Lee is extremely knowledgeable on the technical “behind the scenes” side of the clinic, and thus works extremely hard to make sure everything runs smoothly and according to plan. On any given day, you may find her working with patients in the treatment room to practice her experienced care to ensure our patients are in the greatest state of health as possible. She is a horse lover, having many years of riding experience, and is the proud mama of a feisty cat named Clark (pictured), and a Mexican rescue dog, Kaia. She has worked here for almost 6 years now and is very experienced with animals! 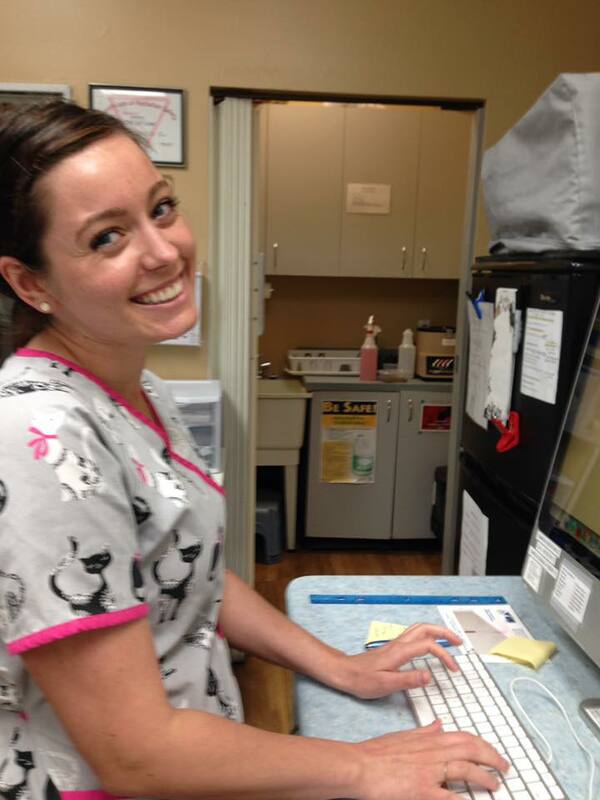 Danielle is one of our awesome vet techs who has worked here for seven years. She graduated from tech school from Thompson Rivers University in 2015. She is extremely passionate about her work as the feline dental hygienist and she would gladly answer any questions you may have about your cat’s dental health. Additionally, she practices a wide variety of procedures and is very experienced in doing so. Her sense of humor and bright attitude makes all in her presence smile. She lives with her husband Dusty and cat Merlin, and on her days off she enjoys camping and exploring the beautiful city that is Victoria! Caitlyn in an extreme help in the clinic as she has been with us for over three years. Her main focuses are patient care in the treatment room, facilitating appointments and working one-on-one with veterinarians in lab work interpretation. She has a bit of a mini farm at her house... two cats, two dogs, and four chickens! She also has a wicked arm with a history of playing fast ball. Caitlyn aims to become a veterinarian, helping out all kinds of animals. Marina spends most of her time working alongside Dr. Bell while in the clinic, however you might find her helping with more advanced cases in the treatment room since she has been with us since 2016. She is a “hands-on” worker who provides immense support to the technicians, and her empathetic nature benefits us all as she shares her knowledge and experience with the rest of our staff. She is an avid soccer player, with the women's league out in Juan de Fuca. Marina hopes to follow her passion through to become a veterinarian, specializing in equine! Leah has worked at the clinic since 2012 with two beautiful fur babies. She's currently a pediatric nurse at Victoria General Hospital; kitties and kiddies are her life. She is the resident meow-turnity nurse at the clinic, and enjoys fostering pregnant mums, and hand raising the orphans (she is used to a lot of night shift bottle feedings). Leah is the face behind our social media accounts on Facebook and Instagram, and runs “Leah’s Lectures”. This vlog provides insight into different aspects of being a cat owner, and often frequents visits by one of Pacific Cat Clinic’s old fosters, Merry. Netanya is an excellent asset to the clinic, helping out our technicians in the treatment room, as well as bringing her friendly smile into the exam rooms with patients and clients. She loves working with the kittens and knows the ins and outs of adoptions, so you can direct any questions you may have to her! Netanya has now worked with us for over a year and hopes to become a veterinarian in the future. Elle studied at the University of Victoria and has completed a Bachelor of Science in Biology. She has been with us since April of 2018. Her favorite area is working with clients to facilitate appointments and aid veterinarians with patient treatment plans. She also enjoys helping technicians with procedures. With her free time, she enjoys biking, visual art and being with friends. Shayla is very passionate about the scientific/procedural work in the clinic, and thus takes great initiative to work side-by-side with the technicians to provide as much hands-on aid as possible. She also spends much of her time working with and caring for the rescue kittens that come to us. Shayla enjoys hiking and exploring the island in her spare time and hopes to become a veterinarian someday with a specialty in surgery. Alex has a diversity of work in the clinic, helping technicians, facilitating appointments and caring for the kittens. He is always making everyone smile with his humor and positive attitude. He grew up surrounded by animals, including cats, donkeys and cows. In his free time he likes to hang out with his family and go hiking. Alex hopes to become a veterinarian in the future. As our valued receptionist, Kiarra provides a firm foundation of support to our staff and clients with her great communication skills and organization ability. She can answer any question that you may have regarding kittens, scheduling, technicalities and much more. Outside of the clinic, Kiarra sings, composes music, and choreographs for her local community theatre. Kiarra’s aspiration is to eventually become a family doctor. Katherine has always loved animals and has raised everything from fish to ducks, so working with animals is a dream. She has a diversity of jobs in the clinic, from patient care to client communication, and her versatility shines through her work. One day you may see her in the treatment room aiding technicians, while another day you may catch her in an appointment, working with a veterinarian to facilitate the needs of your cat. In her spare time she enjoys spending time with friends or going out in nature. Taya is our competent administration support employee who works to keep everything organized and running smoothly. She hopes to one day obtain her CPA and become an accountant. She owns a cat of her own named Twist and is planning on adopting a baby kitten in the near future and naming her “pancake”!